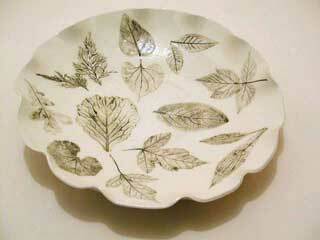 Bring outdoors in to your home by serving on this platter made from pressing real leaves into the clay. Description: This platter is food, dishwasher, microwave, and oven safe. Actual leaves were used in the process of making this platter; it also has fluted edges to enhance its design. The placement and type of leaves are different with each platter so no two are alike. This platter is approximately 16 inches diameter by 3 inches to 3 ½ inches high.